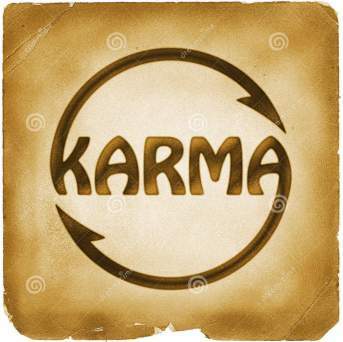 I don't believe in karma nor anti-karma (what some express as "no good deed goes unpunished"). This frees me to do the right thing for the right reasons without the taint of selfishness or unnecessary fear. I'm not expecting reward or punishment for doing the right thing, and if I do the wrong thing any punishment is deserved. It's somewhat liberating. 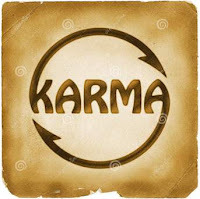 I have observed something like karma; not some mystical principle, though. Just the fact of what we do has an effect on our reputations, which influences how other people treat us. This doesn't change my choices; I choose to do what is right, and moral i.e. good for society, from a freedom outlaw's perspective whether it has a positive or negative influence on my reputation. It's just ice cream that it usually has a positive influence! Right and wrong are not determined by government, or laws, or society, or what is popularly believed; right and wrong are determined by reality—the reality of the nature of the world we live in and the reality of the requirements of human nature. Wrong is living in defiance of reality, in defiance of the principles that describe the nature of physical reality and defiance of the principles that describe the requirements of human nature as volitional, intellectual, rational beings. Doing right means living in conformance to the requirements of nature which reality rewards with pleasure, success, and happiness. Doing wrong means living in defiance of the requirements of the nature of reality which is punished with pain, failure, and despair. No one is required to do right, but if they do not do anything right they will die. If they do some things right but do some things in defiance of reality they might live but will suffer the consequences of being less than they could be as a human being. I choose to do right because it is the only way to live successfully in this world and because I know you cannot do wrong and get away with it. It's not karma, it's the inevitable consequence of defying reality.